Sips & The City: What's on my Rack? On my WINE rack, WINE. The New: I have resurrected this via my Instagram account! Find new #whatsonmyrack posts at https://www.instagram.com/sipsandthecity/! The Old: Details and short notes on wines I have at home when I finally drink them. Most recent additions at the top of the page. Check it out regularly (updates as wines are opened), and start adding up how much I've spent on wine in the past few years! Yowsa! As I've written about previously, this winery puts out some pretty good wines. I have volunteered with them on several occasions, which is where I picked up this bottle (I love working for wine!). Fun fact: if you remember, I helped bottle the 2008 vintage of this! Tonight, this was a perfect wine to curl up with on the couch for some TiVo. Color is a deep burgandy, almost maroon. Nose brings black current with a hint of peppery spice. Taste brings a mouthful of flavor with a tannin bite to the back of the palate. It finishes quite smooth and much reflects the balanced blend that makes up the wine. 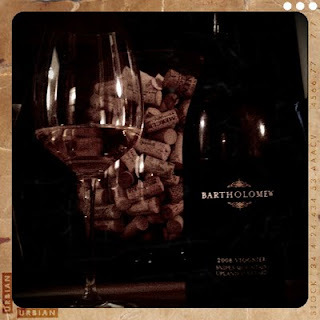 I came across this lovely wine during last year's Passport to Woodinville event. 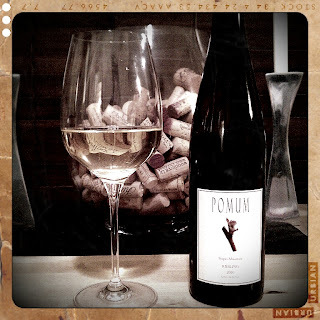 I had never visited Pomum before and I was pretty impressed with their wines. Even though it was raining the day I found this, it instantly reminded me of summer and I knew it was a must have. And of course I end up drinking it when it's grey and dreary outside, but hey, it reminded me of summer again right? Color is a straw gold, nose has strong citrus and soft tartness. Taste has an acidity zing right at the tip of the tongue and an enjoyable tartness all the way through the palate. Ah summer.. please come back? I picked this one up back in early November when I made my trip down to Sonoma for the weekend. I LOVED this wine when I tasted it at the winery and ended up picking up two bottles. One was taken home to Alaska at Thanksgiving to enjoy with butternut squash soup, and this second was enjoyed by me here at home. Color is a super light golden hue, nose is sweet but not overly so. Taste brings well balanced acidity with flavors that linger on the palate long after you swallow the taste. 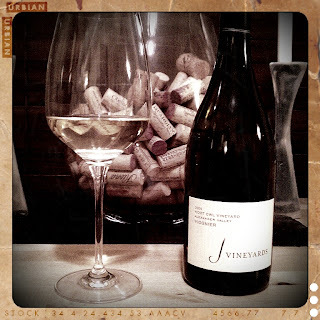 It's a crisp and fruity viognier, which I have always been a fan of! I received this bottle as a birthday gift back in June of last year from a co-worker! 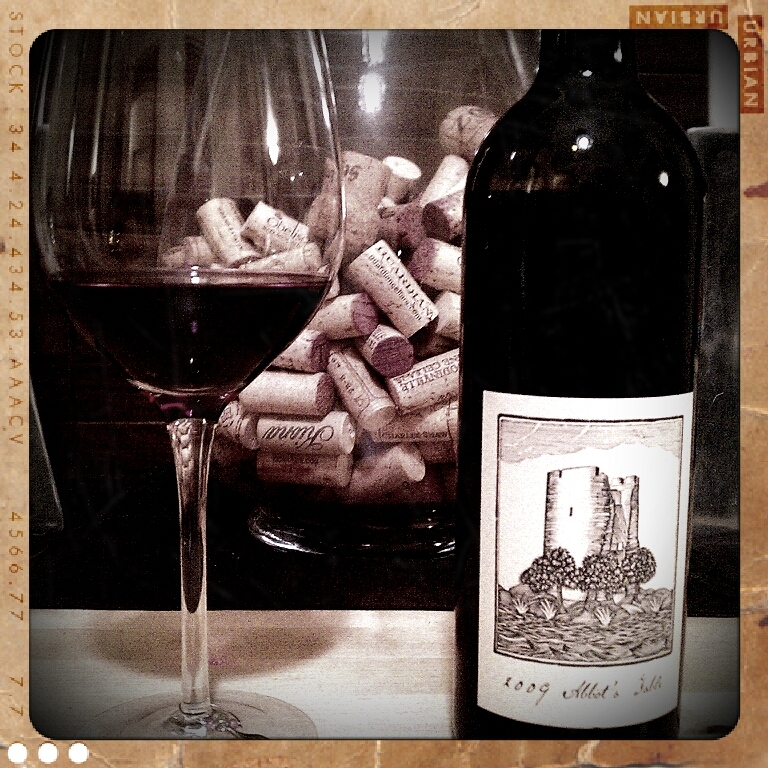 I've tried previous vintages of the Abbot's Table and it always proves to be a great blend. This year is no different, with quite the array of grapes used for the wine. Color is deep and dark, nose is warm and rich without being overpowering. Taste has tannin at front, full flavors from start to finish. Hint of spice. As the colder fall temperatures roll in, I find myself craving a big red to warm me up (I am SO a seasonal wine drinker, summers are whites only, winters bring a lot of reds!). Tonight I thought a big cab would do the trick so I opened up this bottle, which I had received as part of a wine club shipment. Color is a deep dark burgundy, nose has rich berry and chocolate flavors. 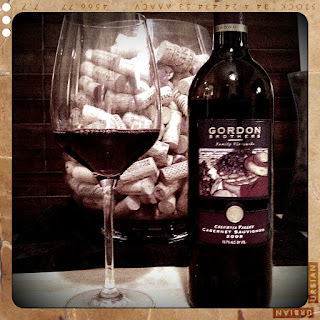 Taste brings dark fruit, a mocha spice, and a ton of tannin to the back of the palate. A good cold weather wine, that's for sure! As with some previous bottles, I've been embracing those last warm days of summer by enjoying the "summer sippers". I recently organized my wine and came to the realization that I have a lot of rosé, so it was go time on getting through a few of those bottles while the sun was still shining here in the Pacific Northwest. Tonight I opened up one of my Vinyl rosé bottles (I have 3!). I have enjoyed this wine since the first time I tried it. The color is AMAZING and pops so brilliantly against the black label. Nose brings notes of strawberry. Taste brings more strawberry and watermelon flavors with a crisp, cool aftertaste. While I'd rather enjoy this next to a pool, no such pool was available so I settled for my couch. Stay strong summer, I have more rosé to drink! Bart is doing some great things down at the old Rainier Brewery Building (well, he's selling some great things! ), including this Viognier that I opened to pair with some halibut this evening. I think I enjoyed this bottle now even more than when I initially tasted it, which goes to show you how things can be so wonderful with food. Color is golden almost like apple cider, nose brings forward citrus flavors. Taste is soft at the front of the palate, then great citrus and acid to rear. It's also got a bit of a "zing" almost what you would get with sparkling wine. So delightful for this warm September evening! Suprise! New phone means sweet new app to take photos for my blog. I switched from the "Hipstamatic" app on my iPod to "Retro Camera" on the Droid. Not too shabby.. and now for the wine: I love this wine. I could go on for days about this one. I was able to try it pre-release (I know people) and then had the pleasure of trying it again when I visited the winery back in May, which is where I picked up this bottle (and a few others..). Color is light and almost a champagne hue. Nose has sweet honeysuckle and pear flavors. Taste is a summer party in my mouth (to sum it up). 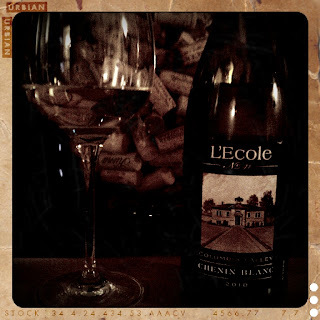 Perfect acidity, perfect citrus flavors, front to back of the palate is quite delightful! Get some of this before it's gone, you won't regret it. Well we all know how busy summer can be. Busy summer means busy Taryn which means no drinking wine at home. Well, technically several bottles have been pulled from my racks to take places, but since I wasn't enjoying them here, I just let it slide. Tonight's selection is a new release from Gordon Brothers, based in the Tri-Cities of WA. This was a wine I picked up in a recent wine club shipment and thought a warm Seattle night was just the time to try it out. Color is a light honey hue. Nose brings out some acid and earthy tones. Taste has that same acid, but is tart, with lime and pear flavors. 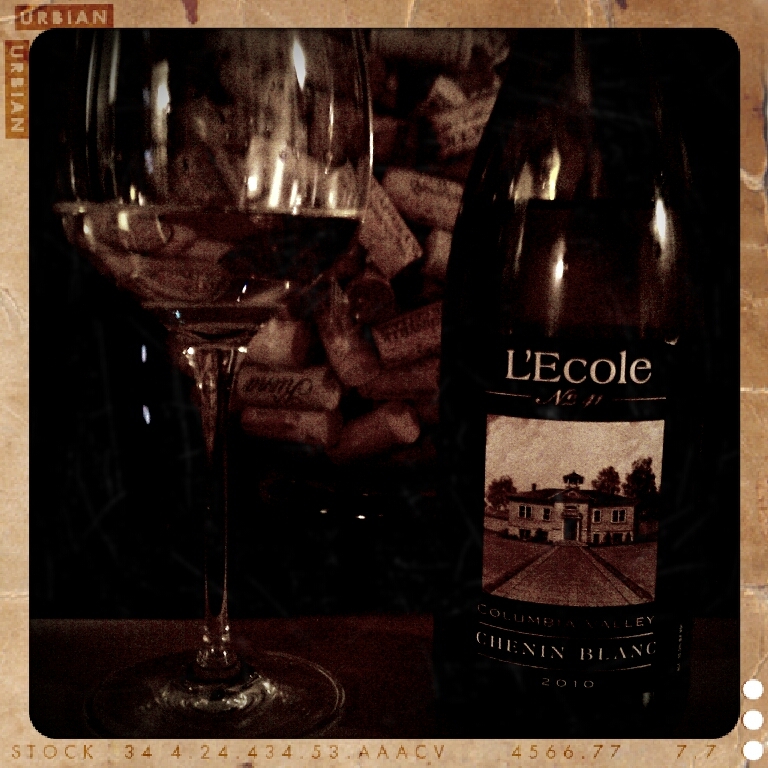 In comparison to some other Sauv Blanc's I've had recently, this isn't my favorite, but it shall do nicely for tonight! I just received this tasty bottle from some friends for my recent birthday. I was having some teriyaki chicken & rice for dinner and thought a sweet riesling would accompany this quite well. Color on this one was a beautiful light honey hue. Nose was sweet, crisp and had apple notes. Taste wasn't too acidic, and was a smooth, not too "bitey" riesling. Those apple flavors came through with a bit of honey dew as well. I like this one, it's organic and has a low alcohol content. A perfect treat for a Wednesday night! Apparently I did not drink enough of my own wine in the past month, how is there a month between bottles for this?! Don't get me wrong, wine was consumed, I just don't think I pulled it from my collection, which is the criteria for these entries. Alas, the sun FINALLY came out in Seattle, which called for a bottle of Rosé. I've actually been sitting on this bottle since last summer (what is WITH me?) so it was due time to break into it. 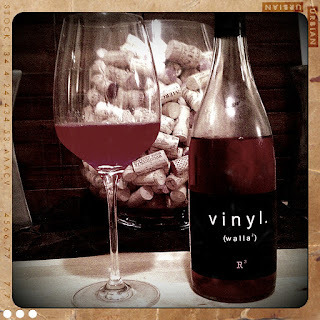 There are a few Washington Rosés that I consider to be favorites, and this one made the list right away. Color is a golden pink (they call is sapphire on the label, couldn't agree more), nose is strawberry, taste is tangy with that same strawberry flavors, citus and a zingy acid that finishes well. It'll be a good food wine whenever I decide what I'm having for dinner. For now I'm just enjoying it as is! Cheers! This was another one that I picked up during my Living Social spurned visit to Northwest Cellars last summer, and one that I quite enjoy. This is an easy sell for the price point, and is a pretty good palate pleaser. Color has gold and honey tones, nose is fruity and crisp, and taste is tart and refreshing. A good anytime wine that would pair nicely with a spicy dish! I've had this bottle for awhile now, I think I picked it up at a visit to Smasne's Woodinville tasting room last year some time. I decided it was time to open 'er up and I was delighted that I did! Color was a cascade of beautiful burgundy from the moment it flowed from the bottle to my glass. Nose: Ok, I'm going to be completely honest and it's probably going to sound a little bit nutty, but my VERY first impression of the nose on this was buttered popcorn. Is that even possible? Whatever it was, I liked it. After I got over that I picked up a very earthy and rich aroma. All Malbec baby. Taste had hints of black pepper and very dark fruit. This is a classic deep Malbec and was a good choice for tonight's thunder storm and homemade pesto I prepared! Well then. There was quite the break in between wines on this wasn't there? March brought vacation, and with vacation you don't drink wines at home! Tonight's selection didn't technically come right off my wine rack. I bought it, it came into my apartment, and then I opened it. But I think it still counts. :) I picked this one up at Bin41, a great wine shop in West Seattle. They had their 1st anniversary party this evening, and I got a nice little bottle to go for myself to enjoy.I picked a good one! Color on this one is beautiful! It's bright and fun and made me immediately forget about the nasty rain outside. Nose is jammy and flavorful. Taste has a hint of tannin, but is very fruit forward with a soft finish. For the price point, this is a killer wine. A perfect bottle to spend my Friday night with! I love that each bottle of wine from my wine rack has a story. This particular bottle was one I picked up as a part of my Mom's 50th Birthday tasting adventure back in August of 2010. We had a wonderful Woodinville wine filled day, which included a visit to Edmonds Winery. They were kind enough to stay open a bit late for us, and our group of 10 definitely did not leave empty handed. The Robt D combines three of my favorite grapes into some serious deliciousness: Cab Franc, Malbec & Cab Sauv. Color on this one is a beautiful crimson. Nose is rich fruit. Taste has a touch of tannin, but brings together light oak flavors nicely. Another score from the Columbia Tower Club Wine Society Tasting I attended in October, this is another fun (non-Washington) wine I decided to liven up my list with. As you may or may not know, Meritage is just the fancy American way of saying "Bordeaux Blend". Yes, it's true: we made it up. This is a nice little Meritage/Bordeaux Blend containing all five of the grapes that are used to make true Bordeaux blends (remember, we learned this in my BLEND Seattle post?). Color is a deep crimson (much like the Coug hoodie I happen to be wearing..), nose has spicy flavors and really shows that Merlot and (dare I say it?) that very small amount of Cab Franc. Taste is very fruit forward and pleasant. That spice present in the nose doesn't come alive at first taste, which is OK by me. Slight bit of tannin to the front of the palate. Like I said, smokin' deal on a very decent bottle! I picked up this lovely little bottle at one of the Columbia Tower Club Wine Society Tastings back in October and opened it up tonight to go with some chicken tortilla soup I had made last week (what can I say, I'm on a homemade soup kick..). For the price point, this is a very nice wine. Color is a very dark current color. Nose has dark rich fruit with just a hint of spice. Taste has a bit of tannin, and is full of blackberry and that rich malbec flavor that leaves you wanting more. I do believe this is the first non-Washington wine I've had on this page, glad to mix it up a bit! Well I was informed today that it's National Drink Wine Day (isn't that every day?) so drink wine I will! Tonight I opened up a nice Chardonnay to accompany a homemade pesto and tomato pizza. This lovely wine comes from 20% New French Oak and 80% Neutral French Oak. The color is very golden, nose has a hint of what makes a Chardonnay a Chardonnay, but stops there. It draws you in with the burst of citrus more than anything, which is why I enjoy this wine so much. The acidity of the wine shows in first taste, and that crisp, citrus flavor continues. No butter Chardonnay here folks, this is a Class A "yes it's barrel fermented but it doesn't taste too oaky" Chard that I simply adore. This was also a 90pt Robert Parker recipient that won bronze at the 2010 Seattle Wine Awards. Showing as sold out online, but find yourself a bottle if you can! For my Valentine's Day date with my TiVo (AND my laundry, how lucky was I?! ), I opened up a nice white from a favorite winery. 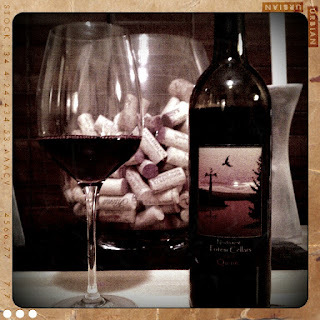 This blend was a Double Gold winner at the 2010 Seattle Wine Awards. Color is very golden. Nose has that pop of viognier that instantly reminded me why I love that varietal. Taste is very well balanced, with just the perfect sweetness to keep you wanting more. This was absolutely perfect along with my Valentine's Day Dinner: chicken pad thai I picked up on the way home from work! This one entered my collection during my tenure in the Gamache wine club. This is one of those bottles I had been saving for a special occasion (i.e. one that I want to share with others who would appreciate it as much as I would), so I opened it on Super Bowl Sunday to share with a friend. I knew I had been saving this one for a reason. Color was a perfect ruby hue. Nose had rich fruit, with the age showing well. Taste had a touch of tannins towards the back of the palate, but had big fruit that has opened up nicely overall. This is one that was quite enjoyable today, but one that I could tell would have cellared nicely for another few years as well. This wine received 90 Points from Wine Enthusiast Magazine and 92 Points from Robert Parker's Wine Advocate. I LOVE Zinfandel. But not all Zins are created equal. I have had the chance to enjoy a select few of CA Zins I could call favs (when I am home and raiding my parent's wine cellar), but until this bottle had not had a wide variety of Zins from Washington State. I picked up this bottle when Two Vintners' Morgan Lee (also winemaker at Covington Cellars) was pouring both Covington and Two Vintners wines at one of Greenlake Wines' Thursday tastings (read more about these tastings in my write up here). Color is a deep plum hue. Nose has cherry aromas. Taste is very fruit forward (which I love) and complex, with out that smoky flavor you get in some CA Zins. This is everything I enjoy in a Zinfandel and truly a pioneer in the world of WA Zin (someone make some more, please??). Much like the Cab Sauv from last weekend, this was another bottle I picked up in a wine basket at a charity auction a few months back. On this particular night I was in the mood for a crisp, clean white wine. I went with a Sauv Blanc, a usual favorite in my book. The color on this particular wine was true to the varietal, a golden hue. Nose had citrus notes, pear and apple. Taste was a bit sharp on the finish, but overall quite crisp and refreshing. This is exactly the type of wine I want on a hot summer day. Great for the price point. Last year, I bought a Living Social special that included a tasting and (4) bottles of wine from Kirkland's Northwest Cellars. I had never visited and thought this was a great deal. One of the bottles I received in that special, the 2005 Intrigue, is 50% Merlot, 28% Syrag, 16% Cab Sauv, 4% Cab Franc, and 2% Petit Verdot. Until now, I hadn't opened up any of the wines I picked up the day I tasted there, so I thought it was time! The color on this is very deep, almost a black cherry hue. And speaking of black cherry, the nose presented dark cherry aromas. Taste had a bit of spice up front that lingered throughout the palate. This rich blend brings flavors from all areas to provide intense structure. This is a 90pt wine from Wine & Spirits and it has won various tasting awards also. A great buy for the price point! This was a bottle that my friend Caity and I had purchased together on a tasting excursion in Woodinville back in July (Read about that fun day here). We decided to make dinner and open this one up to enjoy tonight. This is 52% Cab Sauv, 43% Merlot, and 5% Syrah. It's such a great blend, which is what drew me to it in the first place. Color is a "raisiny" red (as Caity called it). Nose has hints of vanilla. Taste has a bit of a bite at first, with that Merlot coming forward, but it finishes smoothly. Great fruit and this one has aged well. Perfect pairing to our pasta dish with Italian sausage! I picked up several bottles of Mercer in a charity auction a few months back. My wine basket contained six bottles of various Mercer wines, incl two Cabs. We cracked the second of my Mercer Cabs and I was just as delighted with this bottle as the first. This is a Silver Medal wine from the 2010 Seattle Wine Awards. Color is dark but with gentle hues. Aroma is pure cab baby (as I would say out loud). Taste has a bit of tannin and hits the back of the palate initially. Opens up nicely with the fruit mellowing a bit and the flavors balancing. Great price point for a great Cab. I actually just picked this one up last weekend at the Celebrate Washington Wine Auction. It was my blind "wine pull" bottle and I was so excited to get one I had never tried before! This is 48% Merlot, 38% Cab Sauv, and 14% Cab Franc. This is a 92 pt wine from Robert Parker. Color is a beautiful deep dark ruby. Nose is rich with dark fruit. On taste, that Cab Franc jumps out and says hello in a very friendly way. Love the balance, would definitely drink again!